As the saying goes, everyone loves Canadians. This has probably left you curious about your neighbors to the North. Although similar to the United States, the Canadian culture and atmosphere are two things that truly separate this nation from the rest. It’s a country based on respect, courtesy, kindness and equal opportunity, which has piqued several Americans’ interests after the recent election. Whether pro or anti-Trump, Canada accepts all with open arms. Its picturesque landscape consists of Great Lakes, ocean-front properties, snowy mountains, icy glaciers, deep forests and rolling tundra. No two places are the same. Most Canadians, 75% to be exact according to National Geographic, live within 100 miles of the US border, which leaves plenty of open land for the 35 million people living here. To put it into perspective, the US has a population 318.9 million. So with Canada, you get the personable experience of a small town even in the largest of cities. If you’re interested in moving to Canada from the US, it’s the perfect place to retire, raise a family, study or to simply start living the lifestyle you’ve always dreamed of. It’s the land of equal rights and opportunity. The Canadian atmosphere (and weather) varies drastically as you move across the country. However, no matter where you go, every Canadian city is worldly, multicultural, and highly accepting of all people – especially within the LGBT community. There’s also no province short of quality education, with many cities landing on the list of Top Universities. If you head on over to the far West, you have the popular city of Vancouver in beautiful British Columbia. Vancouver is similar to Seattle, thanks to all the rain, but it has the diverse food, culture, opportunity and nightlife of Los Angeles. It’s home to 603,500 people, and thrives on being an extraordinarily diverse city. Other popular Western cities include Calgary and Edmonton, and all are packed with breath-taking scenes. From snow-frosted mountains, worldly-popular ski lodges, crystal clear lakes and deep forests, British Columbia’s cities are the definition of Canada. Each hosts famous events each year, such as the Calgary Stampede, the Salmon Run in Vancouver and Edmonton’s famous mall, equipped with hundreds of shops, an indoor roller coaster and a water park. You can hike up to Vancouver’s Capilano Suspension Bridge found 70 metres above the river. There’s always something to do in this city. In the middle of Canada, you can find the Big Apple for Canadians. Toronto is a smaller version of New York. The City of Toronto houses 2.8 million people in comparison to 8.5 million in NYC according to Google. The biggest, most reputable jobs in Canada often fall within these city lines, and the fashion and culture is just as grand. 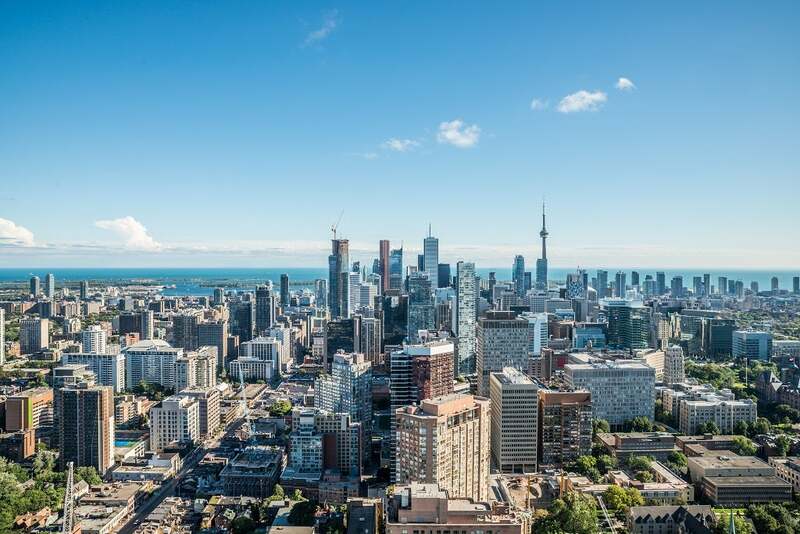 Toronto is lively like New York City, strongly supportive of their LGBT community and is full of all kinds of different people and even more opportunity. This city is known for hosting the Toronto International Film Festival and being surrounded by the stunning Great Lakes. Ottawa is another popular Ontario city, home to 1.2 million people. It’s also home to Canada’s Parliament and Rideau Canal, the world’s longest skating rink in the world. Montreal, Quebec is to the left of Toronto and it’s very similar in terms of excitement. The only difference is that people speak both English and French in Montreal, and the residents like to play as hard as they work. This city is famous for their ice hotels, poutiness, and French dishes. Generally speaking, the further west you go, the more expensive the housing market but the higher the job opportunity. Vancouver is amongst the most expensive cities in Canada, but it’s a great place to look for jobs with a recent employment growth of 3.2%. In 2016, the average house price increased by 16% to $1,008,000, but the cost of living reflects the city’s popularity. Toronto is the second most expensive city in Canada, with a 17% increase in the past 12 months and average house price of $710,000. The employment rates remained steady at 6.8% with a forecasted growth of 1.7% as stated by Ontario Chamber of Commerce. Montreal is fairly affordable, with only a 2.5% price increase over the past year and an average house price of $349,000. However, it also has the highest unemployment rates of 8.9 % as per Statistics Canada. Halifax is one of the most affordable, with houses costing $293,000 on average. Across Canada, you’ll find a vast array of food and culture. The nation offers worldly cuisines, activities, festivals, and shopping. In major cities, such as Toronto and Vancouver you can find areas dedicated to different cultures. From Chinatown and Little Italy, Canada offers little countries within its own. Dine at the top of the CN Tower in Toronto. The restaurant spins 360 degrees, giving you a stunning view of the city and when you’re done eating, take a walk on the glass floor 550 meters in the sky. Also in Toronto, you’ll find the infamous Wayne Gretzky sports bar and restaurant. It combines an authentic Canadian experience and atmosphere with delicious food. If you haven’t had your hockey fill, visit the famous Hockey Hall of Fame and explore the history of North America’s favorite sport. Mingle with the world’s biggest stars when the Toronto International Film Festival comes to the city in September, or climb 1776 stairs to the top of the city during the CN Tower climb. You can also spend a day with the family at the famous Canadian National Exhibition, a huge carnival similar to America’s Darien Lake, packed with games, rides, shows and events. Toque! Is not only a famous restaurant in Montreal, Quebec. It’s also a popular Canadian term used to describe a winter hat, and this dining experience combines culture and food for your enjoyment. Montreal is home to many famous events and festivals for all tastes, from the International Jazz Festival, Just For Laughs Festival and the adrenaline-rushing Formula 1 Grand Prix. Score in Vancouver is a famous Vancouver hangout, known for having the most elaborate, and the best Caesars, or as American’s call them Bloody Marys, in the world. It’s a drink and food combo that’s larger in life – just like the city of Vancouver. When you’re not enjoying the scrumptious food, explore the 405-hectare Stanley Park. It borders the city streets of Vancouver and is surrounded by the sea. There are also many historical sites, museums and events, such as the world’s largest firework display competition. The Celebration of Light that lights up the sky with a fantastic firework display along with concerts, adventure races and much more. Education is mandatory for children in Canada. From public to catholic schools, the education system starts with kindergarten classes for kids as young as 4 years old. Children continue school until grade 12 at the age of 18. At that time, they have the privilege of applying for post secondary education to obtain a degree or diploma for a career of their choice. Canada is full of reputable, renowned colleges and universities across the nation. Tuition fees can range anywhere from approximately $4000CAD to $10000CAD per year. Fortunately, Canada offers several grant and scholarships programs to help people further their education. The first thing every American should know is that you must renounce your U.S. Citizenship to gain citizenship elsewhere. This will cost approximately $2350, which is the highest fee in the world. In order to become a Canadian citizen, you need to have lived in Canada for 6 years and been physically present in the country for at least 730 days of every 5 years. If you’re considering moving to Canada for the first time, you must gain acceptance through many of the Government of Canada immigration programs or through a visa. You can apply under any of the 6 categories of Permanent Residency; Skilled Worker Class Immigration; Business Class Immigration, Provincial Nomination, Family Class Immigration, Quebec-Selected Immigration or International Adoption. The costs vary depending on the type visa you need. You should also consider the additional legal fees for lawyers which can reach upwards of $5000CAD in visa application fees. In every province, you’ll find a city suited for you. Whether you’re interested in moving to Canada to start a family, to retire, to celebrate your equal rights or to study, Canada has a solution. Every city has its highlight, from the nightlife of Montreal to the simplicity of Halifax, and from the exhilarating outdoors of Vancouver and the multicultural Toronto. This high quality of living will come with a price higher than what most Americans are used to, but it can be well worth it once you make the move.